Anwara Begum wakes up at the light of dawn each morning. In the early hours of the day, the Balapur refugee camp seems still and lifeless, despite the thousands of people that now call it home. She spends the entire morning begging on the streets of Hyderabad, a major city located in south India, and doesn’t return until late in the evening. 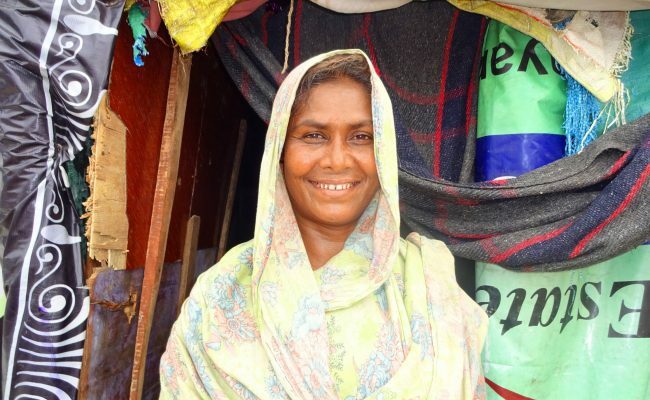 Despite living as a beggar in a foreign country, Anwara is thankful she and her daughter are still alive. Anwara is originally from Myanmar (Burma) and belongs to the Rohingya Muslim community. In recent years, the Rohingya faced severe persecution forcing many to flee their homeland. Anwara’s husband passed away years ago and she realized the country was no longer safe for a window. She spent three days traveling on foot through mountainous terrain in the darkness of the night to reach the Indian border. She has three daughters; two of them are married, while the younger one – who’s mentally challenged – stays with Anwara in the refugee camp. Although their lives are no longer at risk, they are suffering from extreme poverty. Even after an entire day of begging, Anwara collects only Rs. 80 (or $1.19 USD). That is simply not enough. If they were lucky, they received leftovers from their neighbors. The nights they didn’t, they would usually go to sleep on empty stomachs. 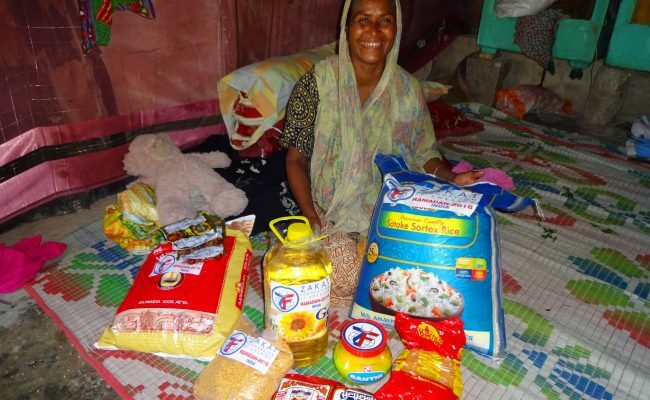 When it came time to break the fast in Ramadan, Anwara would be fortunate if she had a piece of bread to split between her daughter and herself. However, things changed with the support of Zakat Foundation of America (ZF). During the month of Ramadan, ZF was distributing food aid to over 40 countries around the world, including support to Rohingya refugees in India. Anwara was one of the beneficiaries of the program. She claims she has never seen so much food in her life once receiving the food package that included 25 kg of rice, 10 kg of wheat flour, 5 kg sugar, 5 liters of refined oil, 1 kg of dates, tea powder, and 1 kg of ghee (butter). Anwara barely had words to express her happiness. 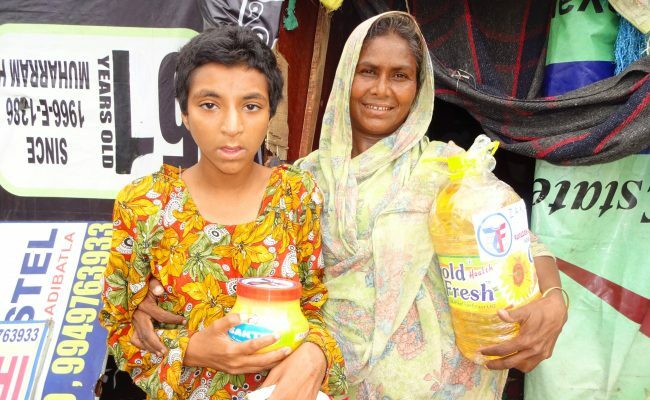 “On behalf of all Muslim refugees living in Balapur camp that received a Ramadan package from you, I would like to say a big thank you to Zakat Foundation of America (ZF).” You can send food aid to Rohingya families like Anwara Begum’s today.